Members of the Winter Hill Gang, including the notorious James "Whitey" Bulger (bottom right) and the author's cousin, Joe McDonald (top left). At least, that’s what I’m told. I never met Joseph McDonald, but word is he preferred using a handgun. He liked to get in real close so that the soon-to-be deceased could figure out what was coming. His intense, bald visage would be the last face they would see on this earth. He was my grandfather’s first cousin, my first cousin twice removed: a bookmaker, loan shark, thief, World War II vet, drunk, killer. He was a member of the Winter Hill Gang, the most notorious Boston-area outfit of the last half century. There are Winter Hill guys who have admitted to murdering 20 people, guys who tried to run guns for the IRA, and guys who fixed horse races up and down the East Coast. 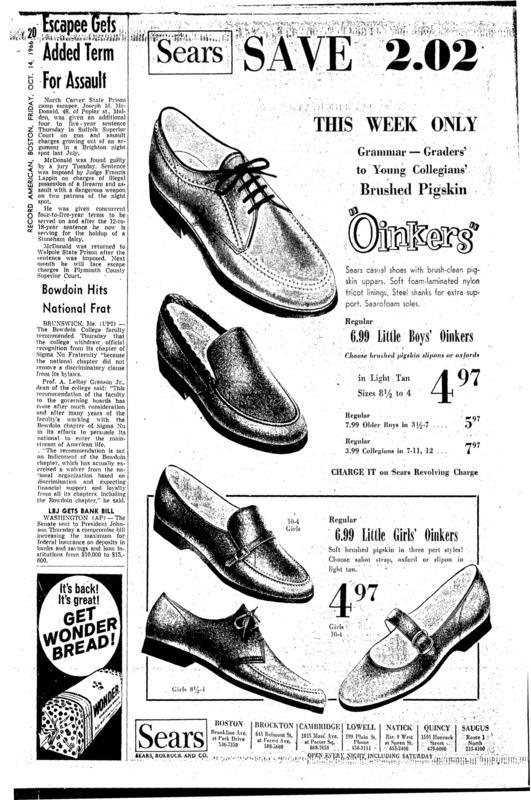 Some of the Hill’s associates started grabbing headlines in the early 1960s. Some of them, like James “Whitey” Bulger, continue to do so to this day. Lots of people died. Lots of people were sent to prison. So being related, even distantly, to one of the main players in that gang is, well, strange. My father’s family—a clan of nurses and engineers—know next to nothing about Joe, who died in 1997. They are not the sort of people who rob warehouses or break out of prison. The author's cousin and Winter Hill Gang member, Joe McDonald. One of my aunts says there was shame, that my grandfather and his siblings were law-abiding folks who couldn’t relate to Joe’s life. Joe’s name was never mentioned. The relatives who did meet Joe only did so once or twice, and memories are slippery things. Did he get pinched in a New York City train station while dressed as a nun with a machine gun under his habit? No, says another one of my aunts, the machine gun was in a hockey bag. There was no habit. It was all over the news, she says. Family lore alleges he once showed up to a relative’s funeral dressed in drag to avoid detection from the cops who had arrived to arrest him, but corroboration is impossible. Humanizing details are nonexistent, at least from my family, so I had to look elsewhere. Jimmy Martorano in his 1975 mug shot. “Joe was the greatest guy in the world.” I’m at lunch in one of the many Italian restaurants in Boston’s North End, seated across from Jimmy Martorano. Jimmy knew Joe. Both were in Winter Hill. Both did time in prison. In 1979, the Boston Herald-American described Jimmy as, “a man with the power and the stature to order others to commit violence as well as committing violence himself." But at this moment, spooning his pasta frigoili, Jimmy doesn't seem dangerous. He is articulate and genteel, and dressed in a red zip-up jumper and gray sweats, he could be just another jocular Italian grandfather. He talks about Joe’s naval experience in World War II. He acknowledges Joe’s drinking problem. He says Joe was a dependable friend. A newspaper report of my cousin Joe's prison breakout. Click to enlarge. We also talk about the extensive length of Joe’s rap sheet. In 1961, he was part of a crew that robbed a dairy, for which Joe was thrown in jail. In 1963, he broke out of prison. He was on the lam for almost three years. While on the run, he threatened a witness who had testified against him, as well as the cops who had spearheaded the investigation into the armed robbery. Joe's freedom ended after a 1966 shootout with police and a footrace through Brighton, a western borough of Boston. He managed to squeeze off four shots; none of them hit their target. In 1971, he allegedly stole collectors’ stamps worth anywhere from $50,000 to $500,000, depending on which media account you choose to believe. There was also the massive horse-racing scheme. In the late 1970s, Joe was among 21 indicted for fixing races up and down the East Coast. In the indictment, Joe is quoted as suggesting that one of the jockeys who reneged on a bribe should be killed and his body placed on the back stretch of a horse track as a warning to other jockeys. He was on the FBI’s Most Wanted list. This is not the portrait of a good man. Richard Castucci, who turned up dead after allegedly leaking the location of Joe McDonald's hideout. 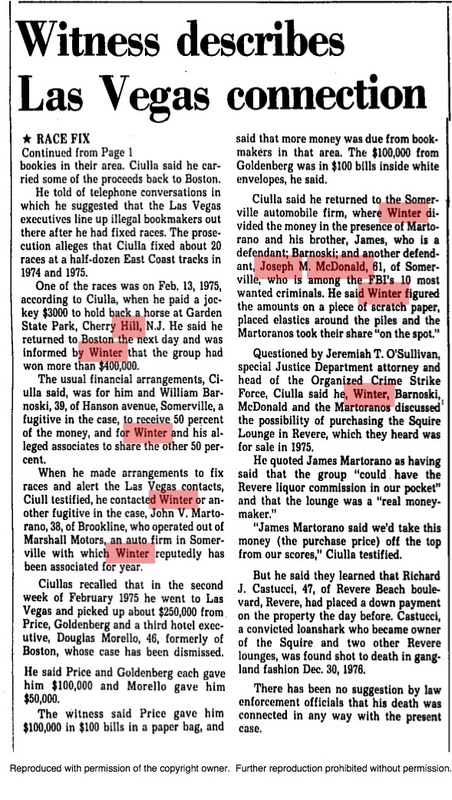 The talk of squealing and stool pigeons eventually leads us to Raymond Lundgren, James “Whitey” Bulger, and Richard Castucci. Lundgren testified against Joe in the collectors’ stamps case. Joe then killed him, according to a federal debriefing of Stephen Flemmi, a notorious thug and federal informant. Flemmi states that, in 1976, Joe went to Sierra Madre, California, and shot and killed Lundgren on his front lawn, in front of his wife, while wearing a handkerchief that covered the front of his face. Jimmy has no insight regarding that murder. He says he had never heard his name until I sent him an email with the federal documents. The full Whitey saga, meanwhile, is too complex to review here. The basics: James "Whitey" Bulger, Boston’s most notorious gangster—who was closely associated with Winter Hill for decades—was also a federal informant. He corrupted the Boston office of the FBI. Federal agents protected him from arrest and prosecution. This allowed Bulger to commit crimes with impunity. After more than 16 years on the lam, he was caught in June 2011. He now faces dozens of charges, including 19 murders. Joe, according to Jimmy, never liked Whitey, but he didn’t have any inkling that he was a snitch. Castucci was a bookmaker turned federal informant who was suspected of being the one who leaked Joe’s hideout in Greenwich Village, New York, to the authorities. In late 1976, Castucci wound up dead in the trunk of a car, wrapped up in a blanket with a bullet hole in his temple. Jimmy says they never spoke of Castucci’s fate. James "Whitey" Bulger before his arrest. The day after meeting Jimmy, I headed to the Winter Hill neighborhood of Somerville—a working-class city just north of Boston—to grab a meatball sub with Bobby Martini. Bobby grew up in Somerville. His father, also named Bobby Martini, ran Marshall Motors for Howie Winter, who, for many years, was Winter Hill’s principal leader. The younger Martini has written a book, Citizen Somerville: Growing Up with the Winter Hill Gang. “He was the one who everyone feared,” he says of Joe. Just around the corner from the sub shop is Marshall Street, and up from Joe’s old house at 40 Marshall, is the garage that served as Winter Hill’s de facto nerve center. It's now a church. “Guys got beaten in there. You think they know that?” says Bobby. Bobby recalls one of his friends delivering beer to Joe in the morning to calm his shakes. Joe was a quiet, intense guy, not prone to jokes, says Bobby. He liked to go to the fights. Earlier in the day, we had gone to the patch of pavement where in 1961, a car belonging to a man named Buddy McLean was rigged with a bomb. Buddy avoided death thanks to an alert neighbor, but that incident, says Bobby, basically triggered the formation of Winter Hill. Over the next few years, the Hill would clash with another criminal outfit, the McLaughlin Gang, in Boston’s so-called Irish Mob War. People died in the ensuing violence, and I wanted to know if Joe killed any of them or anyone else. The video trailer for Bobby's book. Paul Moran was a youth lobbing snowballs in the projects of Somerville when he pelted a blue Chevy Impala. The car stopped and, an old man got out. Moran was with a group of friends. The largest of them suckered the old man in the face. It was Paul’s first encounter with Joe. About a month later, he hit a passing black Cadillac with a snow shovel. Joe and Howie Winter were in the car. Paul, who would spend his fatherless adolescence stealing cars, selling PCP, and drinking heavily, ran. But Howie and Joe let it be known in the neighborhood that they needed to see him. He now needed to pay off a debt. Paul became the gang’s errand boy. He would sweep the garage, fetch coffee frappes and hot cheese sandwiches for the gang, and hand out bottles of Seagram’s Seven to the cops who came around at Christmas. He stayed for more than seven years. We are driving around Somerville. He is telling stories. You could chop his accent with a meat cleaver. He tells me the nun and machine gun story, which my aunt later rejects. He says Joe questioned Whitey Bulger’s propensity for using machine guns. Joe, he says, liked to use a handgun and get close so the person would know. Paul brings me to the spot of the snowball incident. The projects have either been remodelled or demolished. He now lives in New Hampshire and has been sober for more than three decades. Joe is 15 years in the ground. Everything has changed. “If he liked ya, he liked ya,” he says.